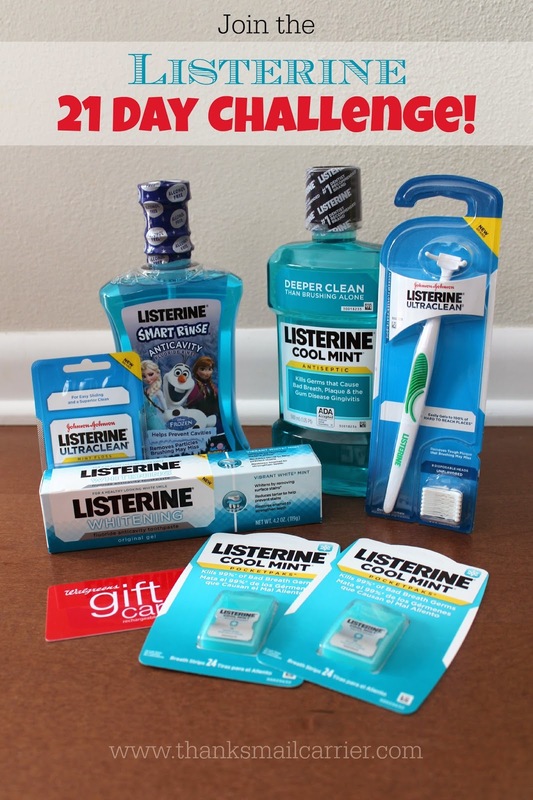 Thanks, Mail Carrier | Establishing Good Habits and a Healthy Oral Care Routine with the Listerine 21-Day Challenge! 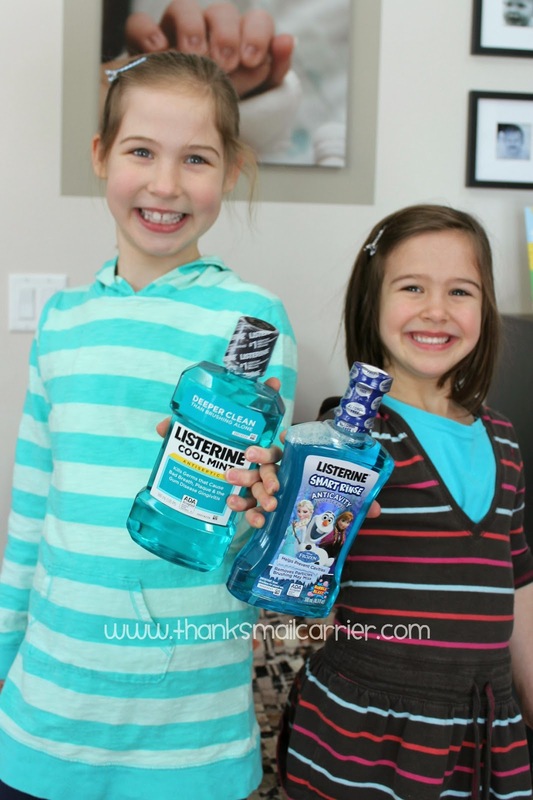 Establishing Good Habits and a Healthy Oral Care Routine with the Listerine 21-Day Challenge! While I have always hoped that my children wouldn't inherit my lack of patience and strong stubborn streak, I have had my fingers crossed that my dental genes would be passed on to them. Having received my own pearly white, evenly-spaced, no-need-for-braces set of chompers from my father, it doesn't seem too far-fetched that I'd wish the same for my own kids (not to mention that my husband's teeth genes are just not nearly as up to par). But... other than my genetics, I have to admit that my oral care habits could use a little improvement. I do brush twice a day, but floss? That's more like a few times a week (maybe). And rinsing with mouthwash to further protect from plaque and germs? Nope, never. So although my kids brush daily and floss often (thanks to our dentist's stern warnings and my husband's dedication), I'd love for them to think of oral care behaviors as routine as opposed to a chore. Which is why it is perfect timing for all four of us to re-evaluate our oral care habits and learn why taking a few extra minutes a day for a complete oral care routine that includes brushing, flossing and rinsing is so important. 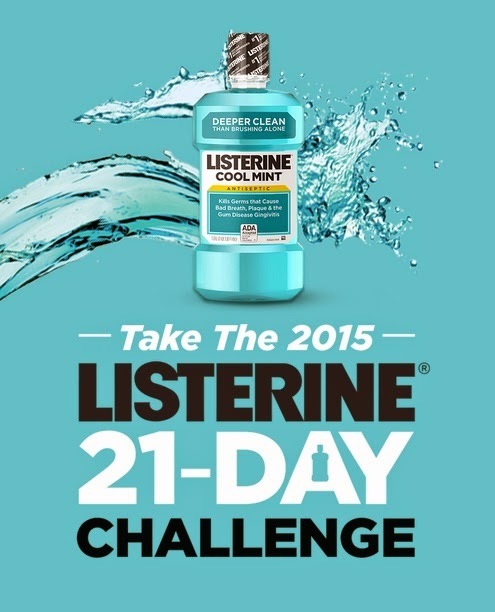 It is time to embark on the Listerine 21-Day Challenge! Did you know that brushing misses 75% of your mouth? Or how about that more than half of adult Americans have some form of gum disease and that oral disease is the most common chronic childhood illness in the U.S.? More than 51 million school hours and 164 million work hours are lost each year due to dental disease! Rinsing with an antiseptic mouthwash each morning and night reaches virtually 100% of your mouth, making it of the utmost importance that we all practice a complete oral care routine that contains brushing, flossing and rinsing twice a day. No more excuses of not having enough time in the morning or being too tired at bedtime, we're ready to take control of our oral health and establish healthy habits! As the first step to kicking off our Listerine 21-Day Challenge, we were thrilled to have the opportunity to try out a box full of high quality Listerine Brand products. How could we brush, floss and rinse twice a day without having the best of the best to use? As soon as my kids saw our Listerine Antiseptic Mouthwash, Listerine Smart Rinse, Listerine Whitening Original Gel Fluoride Anticavity Toothpaste, Listerine UltraClean Floss, Listerine UltraClean Flosser, and Listerine PocketPaks, they were even more excited to get brushing, flossing and rinsing! Step number two, I headed to the Listerine 21-Day Challenge page and signed up, committing myself and my family to rinsing morning and night for 21 days. We could handle this, right? As an added bonus, Listerine is doing more than simply improving participants' oral health, they're offering great ways to tackle another healthy habit in your life as well. When you sign up for the 21-Day Challenge, you are able to choose between an expert in fitness, nutrition or home organization to send you daily personalized emails with insightful information, tips, video content, guidance and support to help establish good habits in your chosen area. I had a hard time selecting just one, as I could use help with healthier habits from all three of these experts! Not only will participating in the 21-Day Challenge help improve your habits and lifestyle, simply sticking with it gives you the daily opportunity to instantly win fantastic prizes such as a Fitbit, a $100 Container Store Gift Card or an Amazon Fire TV! For every seven consecutive days you swish, you'll be entered into one of the sweepstakes drawings for a grand prize. So what are you waiting for? Join us in spending the next 21 days (and beyond) working towards better oral health (and hey, winning an awesome prize or two wouldn't hurt as well)! If you're ready to join the Listerine 21-Day Challenge with us, head over to their website to sign up today. Then be sure to stop by your nearest Walgreens, as they offer a wide range of wellness products, including Listerine (the world's number one dentist-recommended brand of over-the-counter antimicrobial mouthwash! ), that can get you on your way and make it easier to stick with your journey. I love their pocket packs and always have one with me. Listerine really does make my teeth and gums feel clean! I like that it helps with getting rid of bacteria and helping with bad breath! Listerine is my favorite mouth wash. It leaves my mouth so clean feeling. It's never too late to get good oral habits. I love Listerine products. Ive tried others when on sale but always resort back to this brand.